Pete Walmsley RNLI, and Lin Malt Fire Fighters Charity, receiving cheques. As reported below, last September the Round Hayling Kayak Event, organised in partnership between Hampshire Fire and Rescue (Havant and East Hants – Group South) and Hayling RNLI station attracted over 20 competitors who enjoyed fine weather and calm seas for their challenging adventure. 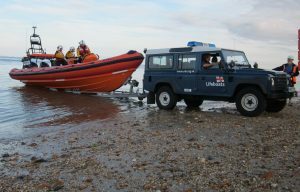 As recently reported the Hayling Island RNLI lifeboat station has been short of boat and shore crew so a recruitment campaign has been running and on Sunday 25 November 17 potential volunteers visited the station. They had a programme of chatting to crew, being shown the boats and personal safety equipment, experiencing the boats launching and then after refreshments a talk on the life of the station. Sunday 2 December dawned with the 5th call-out that weekend to rescue a fishing boat ‘Stardrift’ (pictured on tow) with a lobster pot line round its propeller, so that by the time the station was then welcoming new recruits, the Atlantic 85 lifeboat had already been out. Ten further potential recruits visited the station and followed a similar programme to the previous week. On Monday 3 Dec our station D-Class Lifeboat was returned from its regular refit at the RNLI boatyard on the Isle of Wight. We have been using D-Class 640 ‘ Mabel Davies ‘ which, after sterling service on Hayling, is being returned to the RNLI Relief Fleet. 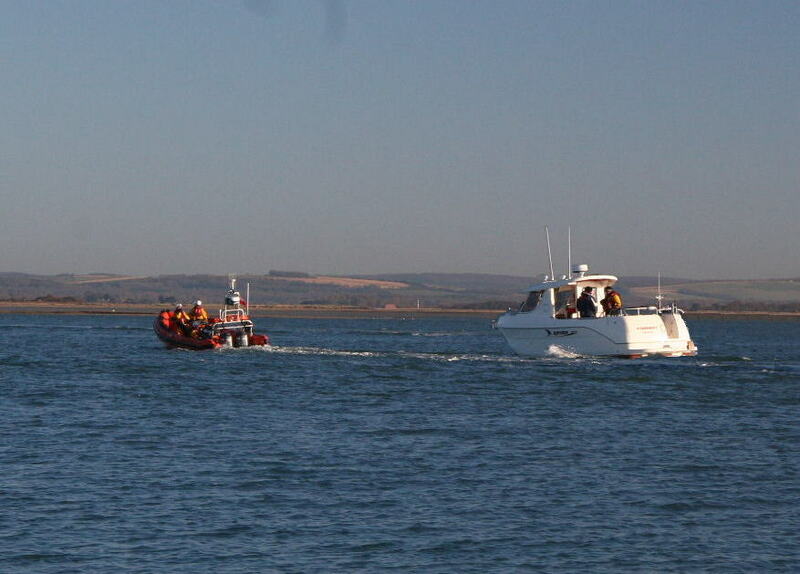 Our boat has come back with a new engine but to optimise on RNLI resources, the other equipment we needed has been moved from the ‘old to the ‘new’ boat and this picture shows Hayling crew members and the RNLI driver making that equipment move. Family Fun Day launched the Co-op Community Support Card. So the Family Fun Community Party has launched the Southern Co-operative Community Support Card and we hope all of our supporters both old and new are now using it when you ‘shop at the Co-op.’ Every time you use the card a donation is made to 3 charities on Hayling Island – The First Responders, Chichester Harbour Conservancy and the Hayling Island RNLI. The card scheme will run for a year and in September 2013 each of these charities will receive one third of the sum raised, and we are talking about £1000’s not £10’s with each charity potentially getting up to £10,000. The Southern Co-operative and the charities were at the Community Party on Sunday 28 October at the Hayling Community Centre and the families that joined us had fun with face-painting, a cake competition, a clown act, Zumba dancing and some great music. We were sorry that more families didn’t make it to enjoy all the free food and fun, and we would like to thank the Southern Co-operative for both organising and funding this event. 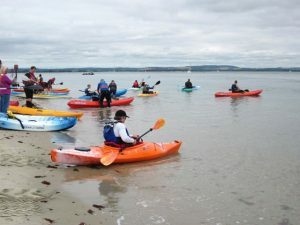 ( Havant and East Hants – Group South ) and Hayling RNLI station attracted over 20 competitors who enjoyed fine weather and calm seas for their adventure. 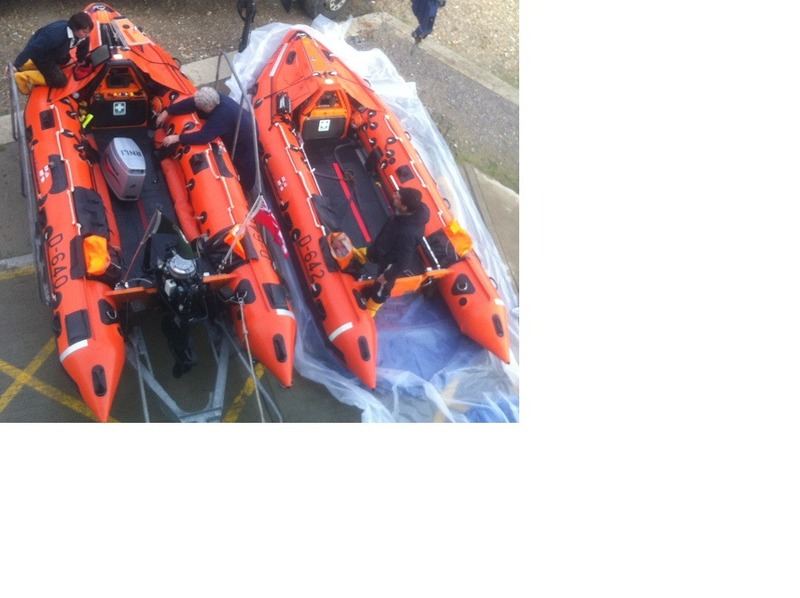 The kayaks, accompanied by rescue boats crewed by Hayling RNLI members, set off from the Hayling RNLI Lifeboat station en route for their first stop at Langstone SC. In the reasonable conditions they made this stop and then continued through Langstone Harbour and out into Hayling Bay where they met more challenge in terms of wave action. Undaunted they made it to the second ‘watering hole’ at the Inn on the Beach. Leaving there they then went along the seafront, round Eastoke Point and arrived back at the RNLI Station tired but happy to complete their journey. 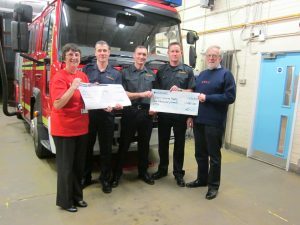 The purpose of the event was to raise funds for the Firefighters Charity and the Hayling RNLI Station and it looks like the brave kayakers have raised in excess of £2000. (Update to follow later). All change at the Hayling Island Lifeboat Station on Saturday 25/8 when the ‘Peterborough Beer Festival III (B-815)’ was delivered as a replacement Atlantic 85 – The previous relief Atlantic 85 “Norma Ethel Vinall” (B-825) was suspected of having developed a defect in the ‘A’ frame and needed to be taken out of service. As its name suggests this boat is one of a series of now 4 that have been generously funded with contributions from visitors to the CAMRA organised Peterborough beer festival – now in its 35th Year. 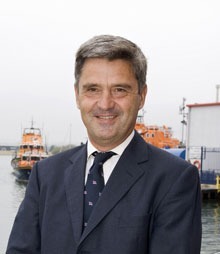 On August 14th, we were honoured to meet Paul Bossier the RNLI CEO (pictured) who visited the station. This was one of a number of station visits and today’s schedule also included Selsey and Littlehampton. Paul was met and shown round the station by Jonathan Bradbury the Hayling RNLI Lifeboat Station Operations Manager. There to meet with Paul were other station officials together with representatives of local RNLI fundraising branches from Emsworth, Winchester and Hayling Island. 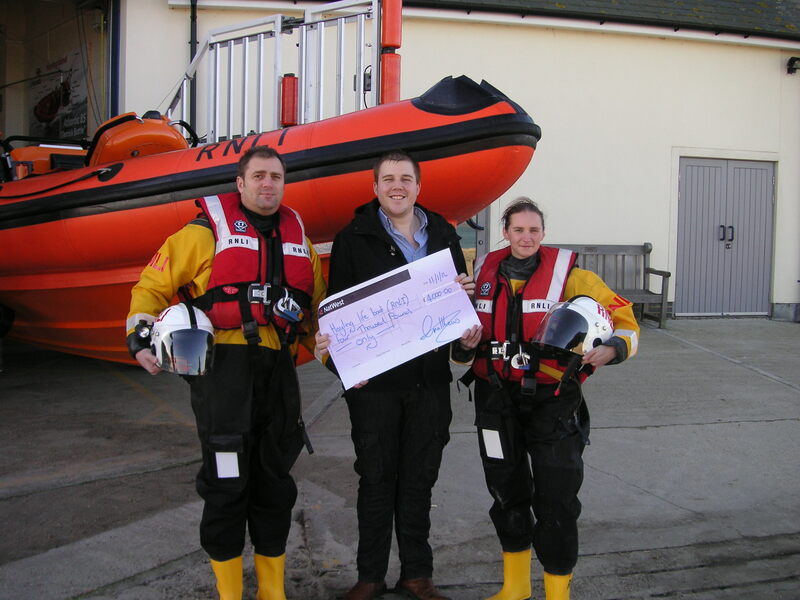 During what was a very informal visit Paul took the time to express his personal thanks to the representatives of the fundraising branches for their tireless efforts on behalf of the RNLI. 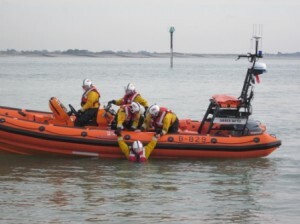 Hayling’s much loved Atlantic 85 Lifeboat ‘Derrick Battle’ was taken away on Wednesday 8th August for an extended refit. This is usual for lifeboats and part of the normal operational cycle since it is essential that the boat performs at 100%. The ‘Norma Ethel Vinall,’ an equivalent Atlantic 85, and one of the RNLI relief fleet, arrived on the same day and will be here until early 2013 when ‘Derrick Battle’ will be returned in tip top condition. So without a pause the Hayling RNLI Lifeboat Station can continue to save lives in the waters around Hayling Island. ‘Norma Ethel Vinall’ being launched. 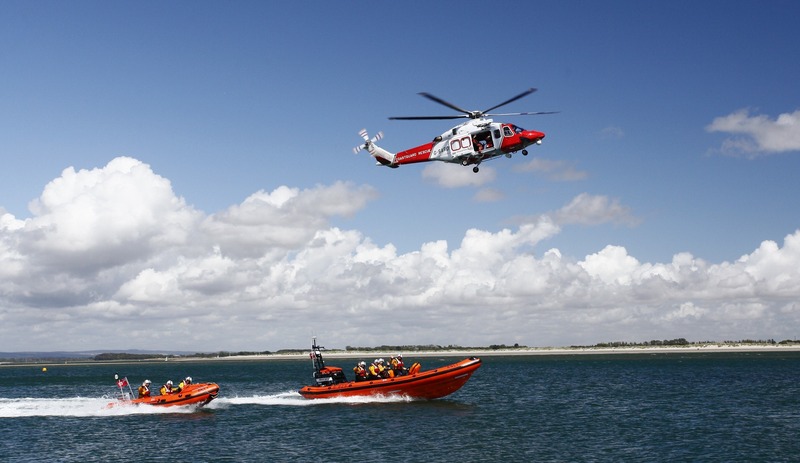 The Hayling Island RNLI Lifeboat Station opened its doors on Sunday July 29th and over 600 people from far and wide came to join in the fun and spectacle. 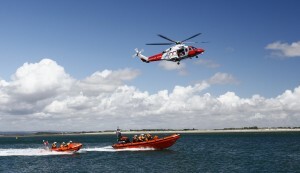 Both lifeboats launched several times in the day and the highlight of the afternoon was a fly-past by the Coastguard Helo 104 helicopter accompanying the two lifeboats. (see picture) Adults and children alike were captivated and 4 year old Milo Grant-Turton from Liss Forest said, ‘I want to be a lifeguard when I grow up and this is so exciting.’ He is a member of the RNLI Storm Force Club for children, and he is intent on visiting all the RNLI stations in the UK! So far his parents have managed to take him to Tenby, Poole and now Hayling Island. Many families and supporters lived locally, but Koos Landzaad from Johannesburg S.A. came to see us with Hazel and John Armstrong, originally from Zimbabwe but now living on Hayling. Other visitors were from Reading, Basingstoke, Manchester and even Dubai. Alex Reid from Coventry said ‘It’s a great privilege to see the RNLI Lifeboat crew in action. They do such a valuable job in saving lives.’ Almost the first visitor to the station was from Le Havre, France staying with his brother who lives locally and who worked as a boat builder including building lifeboats. Families enjoyed the quizzes and competitions, all were thrilled by the lifeboat displays, and the souvenirs and light refreshments stalls were kept busy all day. The model lifeboats kept young and old happy manoeuvring around obstacles, whilst the Hants Fire & Rescue and First Responders displays were added attractions. The day had a sting in its tail when at 22:15pm the duty crew was called out to help a fishing boat in the harbour with engine problems. So for some a very long day working as RNLI volunteers. On and cold January morning a good number of supporters joined us at the Hayling Island RNLI Lifeboat Station, had fun, sampled our streaky bacon butties and generously supported the RNLI SOS Day. From the sale of cakes, bacon butties and souvenirs, plus donations, £325 was raised. In addition the Slipper Sailing Club at Emsworth donated £545 from their recent pantomime, to give a magnificent total of £871 for the day. Our grateful thanks go to all who supported us in these events. A charity dinner organised in memory of Jason Matthews, who died tragically in a car crash on Hayling last September, has raised £4000 for the Hayling Island RNLI Lifeboat Station. Jason had visited the Hayling Lifeboat Station only two weeks before the accident and had always wanted to join the RNLI to save lives at sea. Scott, his brother, organised a charity dinner at his restaurant, the Relentless Steak and Lobster House in Southsea, and was delighted when it raised a considerable sum which he then made up to £4000.